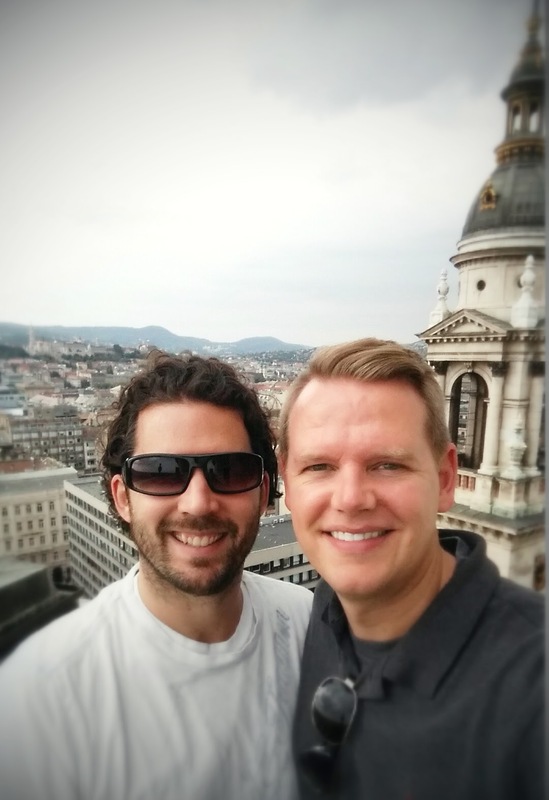 We certainly made the most of our final day in Budapest! Although the weather was grey for a bit, we managed to avoid any rain, which was a big win. And the intermittent clouds and stronger breezes made for an even more pleasant day of walking around the city. Per yesterday’s post, we had a couple of go-backs to see the inside of a couple of buildings we didn’t get to go into yesterday. 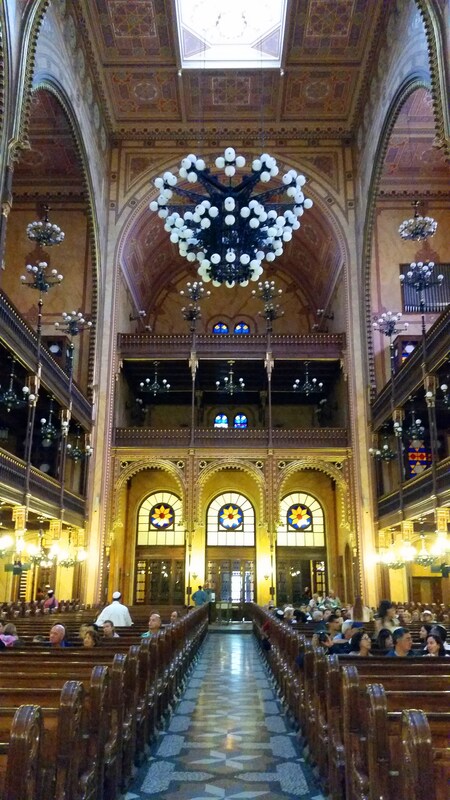 Remember how I said the Dohány Street Synagogue is right next to our apartment? Well, it was still there this morning, so we started there. What an amazing building! 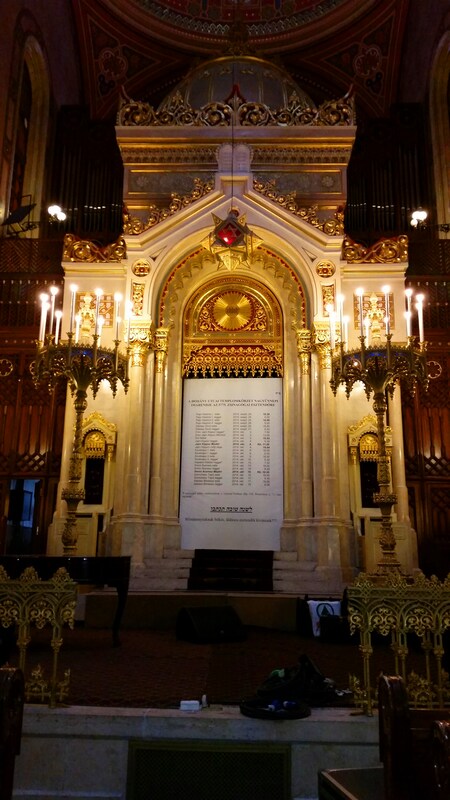 We opted for the self-paced tour, which took us through the synagogue itself as well as the graveyard and museum connected to it. The entry fee was a little steep for a church (2,800 HUF, which is about $11.66 USD), but the larger tour, which covered more ground and had a tour guide, was even more pricey (5,600 HUF/$23.33 USD). Not that I’m averse to spending money on things like that when I travel, but neither Scott nor I thought we would get that much more out of the guided tour in this case. Definitely glad we went in though. 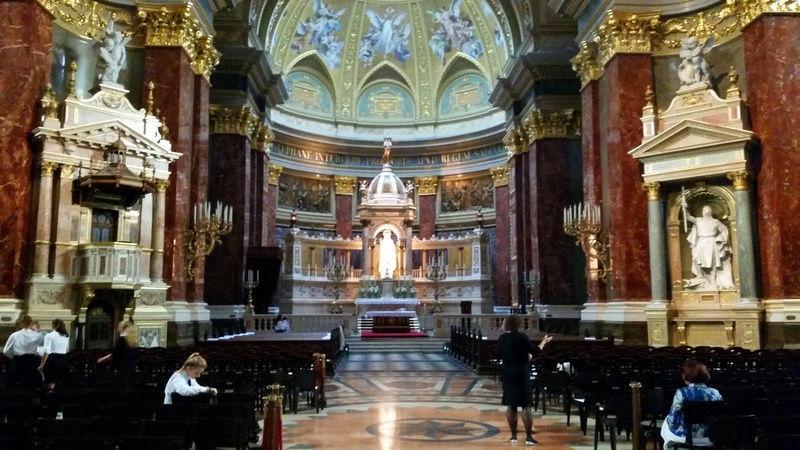 Our second go-back saw us return to St. Stephen’s Basilica. Like the synagogue, this building is amazing both inside and outside. This one doesn’t have a set entry fee, instead allowing patrons to choose a donation amount, which I appreciate. Although I realize not everyone will make the donation, I think it allows more people to visit and enjoy the space. There are two parts of the basilica that do cost money though – the treasury and the dome. We didn’t go through the treasury, so I can’t speak to what that’s like, but I HIGHLY recommend paying the 1,000 HUF (around $4.17 USD) to go up to the top of the dome. 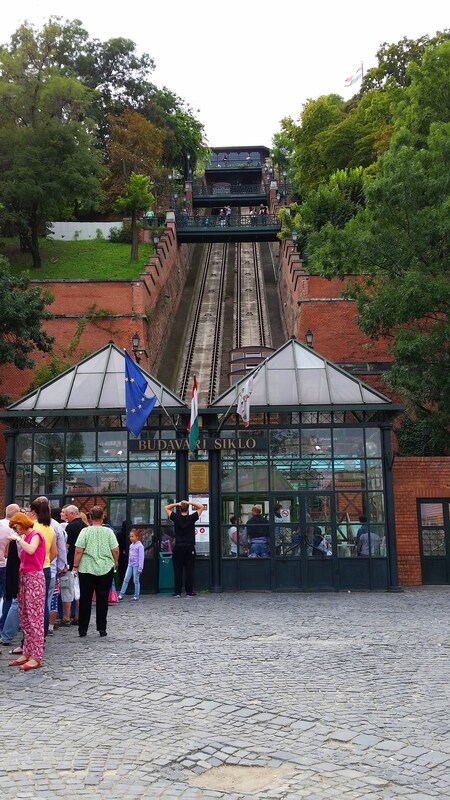 Although it’s a long climb to the top (over 300 stairs), the views you get of Budapest are amazing. It was still kind of cloudy when we were up there, but the views were still awesome. If stairs scare you, don’t worry! Unlike most of the stair-climbing views we saw on last year’s trip, this one offers an elevator! So it’s doable for everyone. 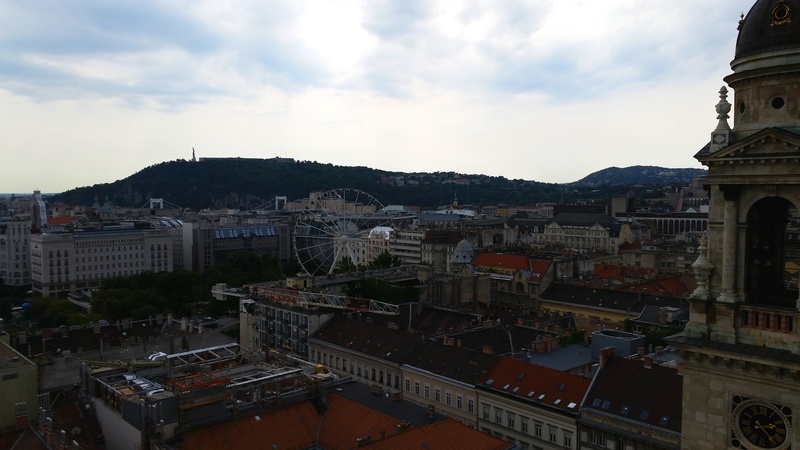 🙂 From the top of the dome, you really get a sense for how big Budapest is (nearly 1.8 million in the city and about 3.3 million in the metro area). 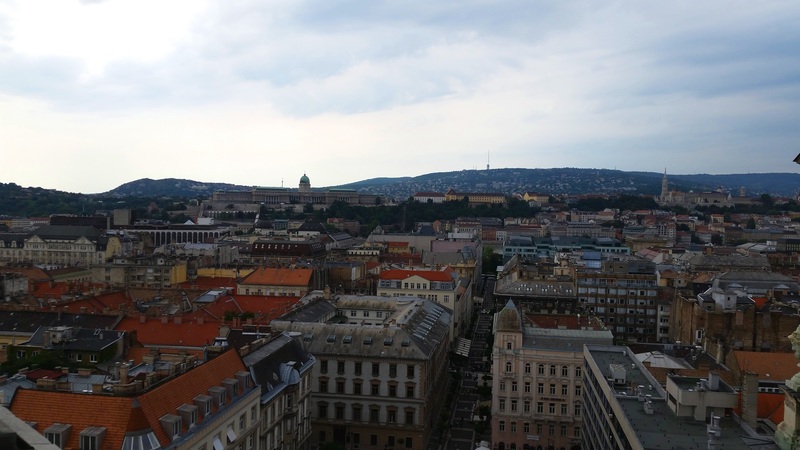 The Lyft driver who drove us from our place to the airport in St Paul told us that Budapest is like a smaller Paris and seeing it from the top of St. Stephen’s definitely made us think of Paris. Don’t miss this one! After wrapping up at the basilica, we finally made our way over to Buda. 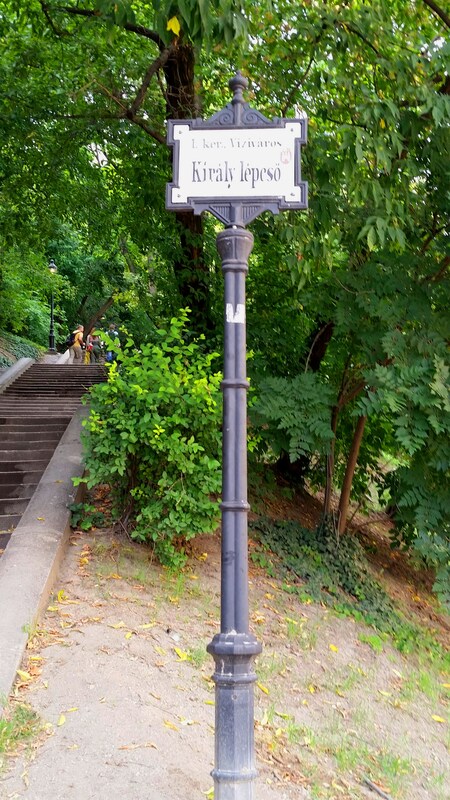 By the way, if you haven’t figured it out yet, Budapest is technically two cities – Buda and Pest. Everything we saw up until this afternoon was in Pest, so it was nice to cross into Buda for a change. 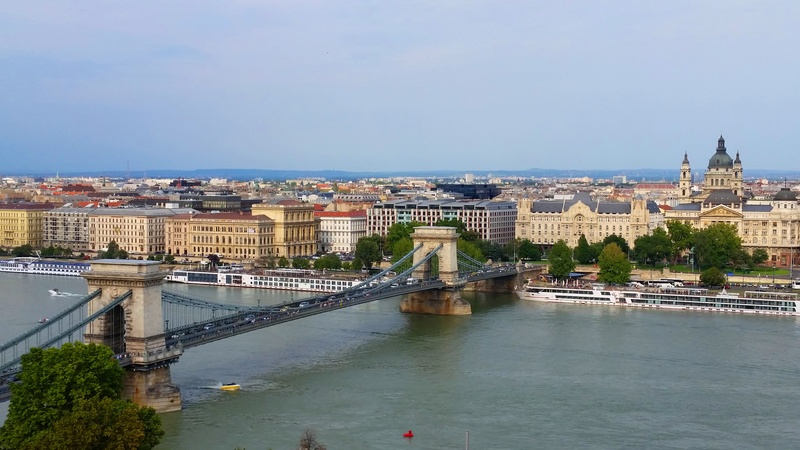 There are multiple bridges you can cross to move between cities, but we opted for the famous Chain Bridge, the first permanent stone bridge built to connect them. That bridge also takes you directly to the base of Castle Hill, which is exactly where we were headed. Now again, it’s the base of Castle Hill, so if you want to actually explore Castle Hill, the only way to do it is by going up, either by walking or via the overpriced funicular. I say overpriced because it costs 1,700 HUF ($7.10 USD) for a round-trip ticket, but a ride only takes a minute or two each way. 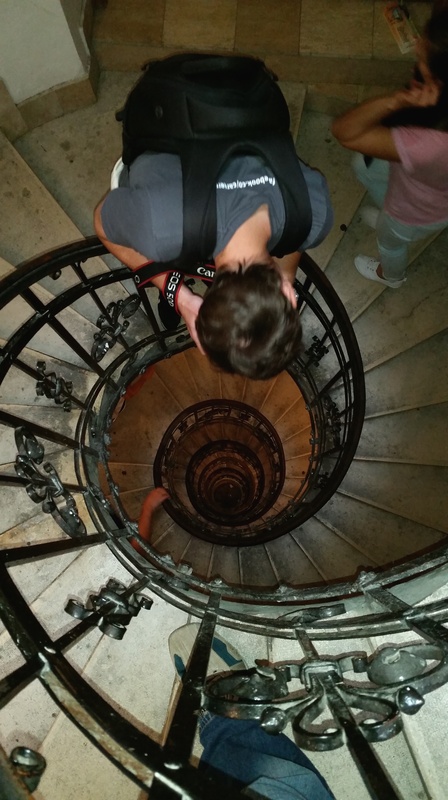 We opted to take the stairs, which…were…STEEP. So, fair warning on that one. If you’re going to take the stairs, get ready to huff and puff your way up. Thankfully, the climb didn’t take too long and the walk back down felt easy as pie. 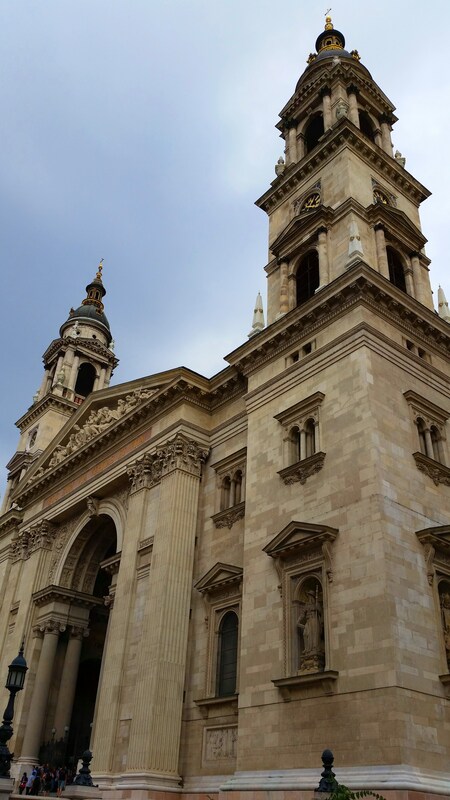 Once at the top, we explored a few things, like the Fisherman’s Bastion, Matthias Church (only the outside, as we didn’t seem to be able to go in), and Buda Castle (again, only the outside). 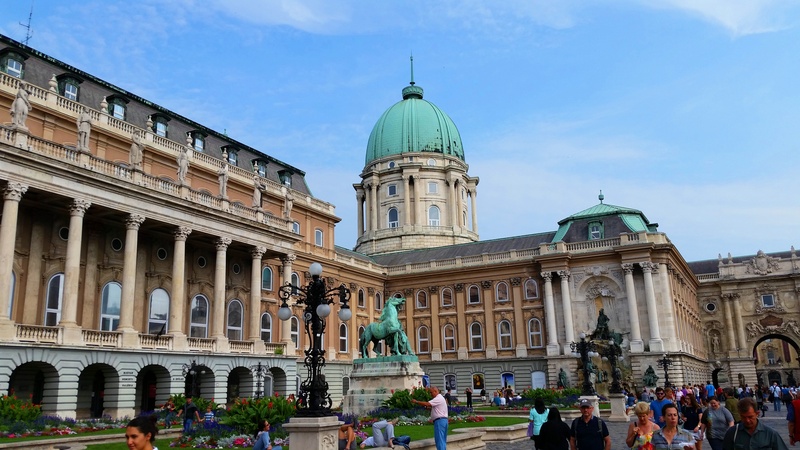 There are lots of attractions, restaurants, shops, and hotels on Castle Hill, so it’s a must-see when you’re in Budapest. 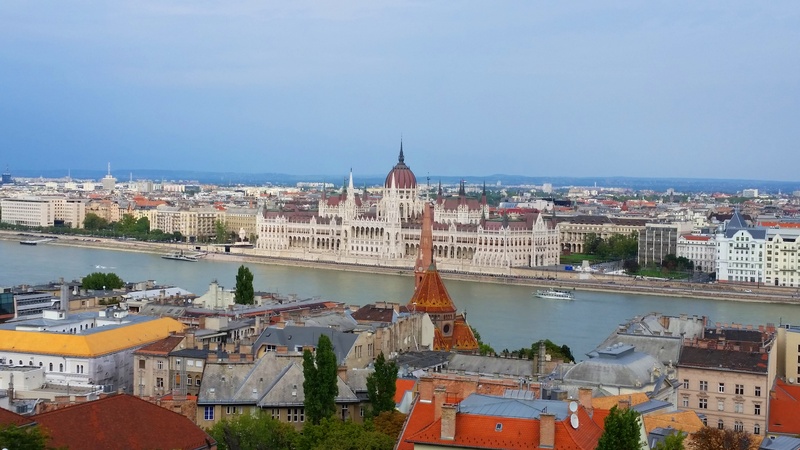 Be sure to check out the views across the Danube from both the Fisherman’s Bastion and the back of Buda Castle – gorgeous! Although we debated doing a river cruise, we never ended up booking one. I’ve heard they’re great though, so I would still recommend one if you can make it work. After Castle Hill, we came back to the apartment to figure out dinner options. We were going to go with another recommendation from our fabulous apartment owner, but the Italian restaurant we chose from her list closes early on Sundays. Boo! But since we already had Italian on the brain, we looked into some top picks and found Trattoria Pomo D’Oro, which was just a short walk (about a mile) from our apartment. It didn’t disappoint! Scott’s pasta bolognese and my really cheesy lasagna both tasted very fresh, as did the bread, salad, and oil that came with them. And at 8,500 HUF (just over $35 USD) for both of us, the price was great for such a good meal. Although one TripAdvisor review told us we would need a reservation, we were able to get a table immediately, so don’t let that hold you back. Wow, I’m wordy today, aren’t I? Distract yourself with some pictures now! Looking towards the front of the synagogue. And now, facing the back. Pretty amazing! 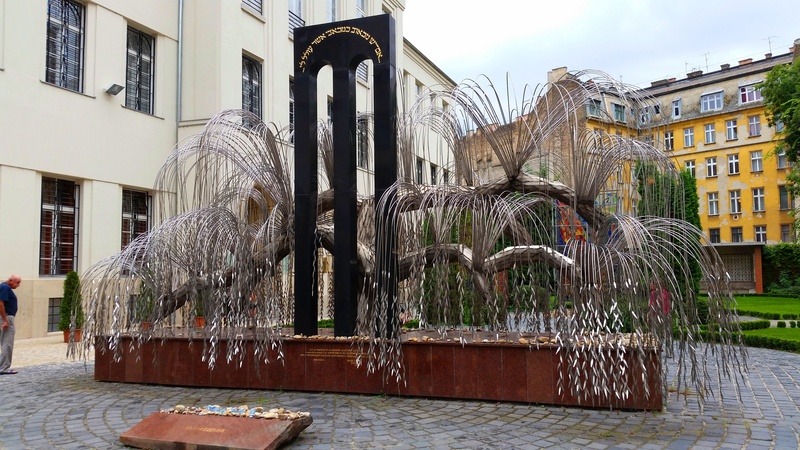 This sculpture is just behind the synagogue, past the graveyard. This is the courtyard-type area in front of St. Stephen’s. Lots of places to grab a drink or have a meal. Or just sit and people-watch. The altar at St. Stephen’s. 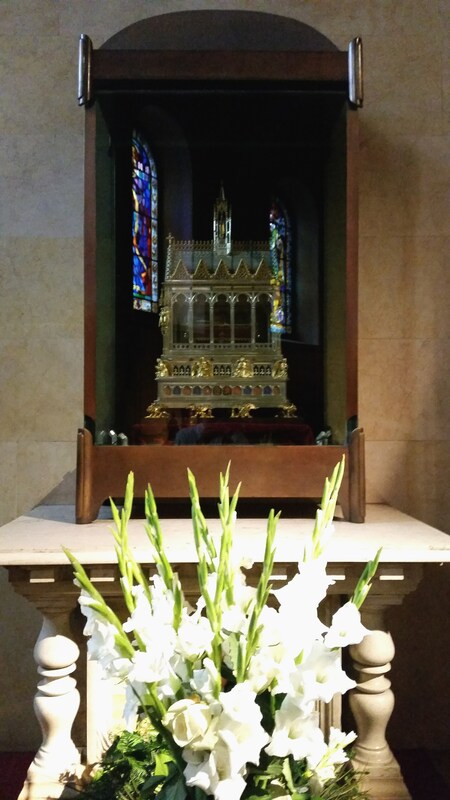 Although you can’t really see it in the picture, that case houses the alleged right hand of St. Stephen. Click here for some of the history behind it. A taste of the views from the top of St. Stephen’s. I told you they were amazing! I told you there were a lot of stairs to climb. Nice view of Buda Castle from the Chain Bridge. …or you can take the scenic route. 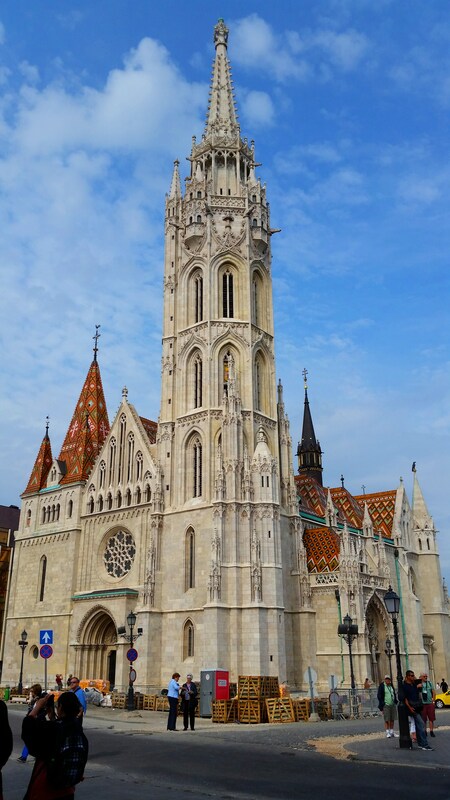 Matthias Church, on the opposite end of Castle Hill from Buda Castle. I love this picture! Great view of the parliament building from Fisherman’s Bastion. It’s amazing how little of that building we could see when we were standing right in front of it. Approaching Buda Castle after walking from the other side of Castle Hill. There’s a great open market behind the castle with all kinds of food, drinks, and other items, as well as some great views, as shown below. 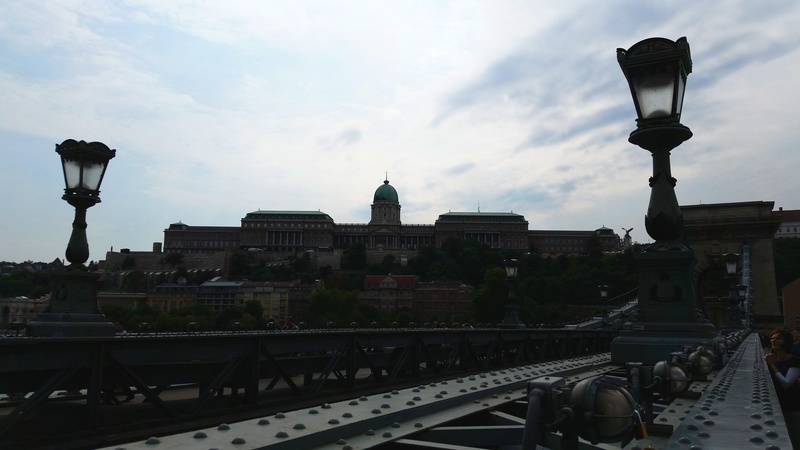 The Chain Bridge and St. Stephen’s. Hard to believe we went from seeing the city from the top of that basilica to looking at it from a distance on the other side of the river, all in the same afternoon. And that’s a wrap for Budapest! Although I was honestly not sure what to expect from this city, I was pleasantly surprised with it. 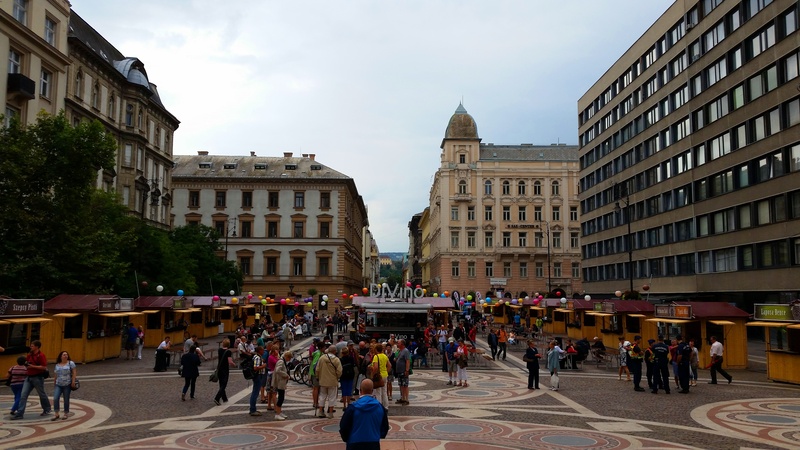 Very walkable, lots to see and do, good food, touristy without being crammed with people, and very affordable. Easily an 8/10 and a recommended visit. Check it out sometime! It’s just after 1130p for us, so we’re going to get some sleep in preparation for our next destination – Berlin! The shuttle is picking us up at 1120a tomorrow, so at least we don’t have to get up early. 🙂 Our flight is at 2p, so we’ll be in Berlin by about 330p and hopefully to our apartment by 5p. Not sure how much we’ll be able to see tomorrow, but at least we’ll have time for a good dinner. Very cool images; thanks for the virtual tour, and the recommendation to check out the scene! I’ll have to put this one on the “to see some day” list.